According to several reports, the City of Des Moines has set aside $750,000 for demolition of the Des Moines landmark 5th Street Pedestrian Bridge. The council is scheduled to revisit the issue at its December 16, 2013, meeting. A brief historic overview from the “Save This Bridge” petition: Built in 1898, the three-span Pratt through truss bridge was built by J.L. Killmar, a prominent local bridge builder who contributed to bridge building in Des Moines and the region during that period. 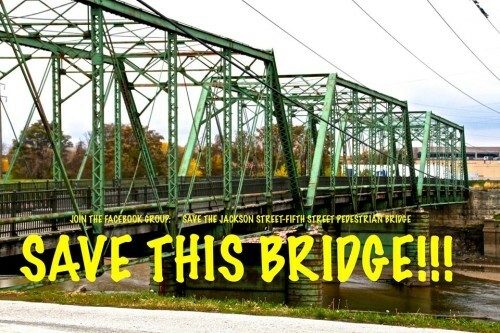 Since 1998, the bridge has been listed on the National Register of Historic Places, which means the National Park Service and the State Historic Preservation Office of Iowa also have a say pertaining to the ownership of the bridge and how it should be preserved. Our friends at the Des Moines Historical Society are organizing to fight for restoration of the bridge rather than demolition.